I hope you had a wonderful weekend! We took full advantage of our snow. Above my daughter and I are making a trail for my son out back... there are several cleared acres of an old horse pasture that make for loads of fun... and an aching back from all of that pulling! My boy has long grown out of his ski boots and now we take turns wearing mine. They're already too tight, so that won't last long. He's also only an inch away from matching my height. I think there will have to be a special ceremony when my first born and I are able to gaze directly into one another's eyes! There's nothing like coming in from the cold to the cozy smells of fresh baking. So we made sure there was lots in the oven... from bread to crackers! The crackers were a new recipe to us and totally outstanding if you like rich and cheesy... which we do. My family would have eaten the entire batch in seconds if I hadn't requested a slow down. A New Year's goal was to move away from store bought snacks foods. These crackers were an attempt to replace the cheddar bunnies my children have a serious weakness for. They are a million times better, and we made them. There were a few adjustments; like substituting the white flour for whole wheat pastry and omitting salt since we used salted butter. Here's the original recipe. Easy and addicting. The flatter you roll them the crispier, but we discovered that the puffy, thicker, and chewier version is our favorite hot out of the oven. For our second half of the batch, we only made them big and thick (1/4 of an inch) and used heart shaped cookie cutters just for fun. These were baked specifically for storing in a glass jar to test how well they'd keep. * The problem is no one can keep their hands out of the jar! If you're looking for a good homemade cheddar cracker to replace those bunnies (and fish) this one's for you! *Suggestion after sampling the next day: thicker and puffier for instant eating; thinner for storing. And for today... we may revisit our favorite pretzel! Any baking happening in your oven, these days? We're always on the look out for new recipes! I have celiac and one of my sons does better without gluten, so recently we made gluten-free cheddar crackers and I even got a mini fish cookie cutter (so. darn. cute!). They were awesome, and just like you said, we didn't have enough to keep so I have no idea how well they store! Also, some of them were very salty because I put my 6yo in charge of sprinkling the salt before we baked them. ;) I've been meaning to make them again ever since. Great snow pic! Those crackers do look addicting ~ yum!! I have the same goal this year - LESS PACKAGING!! And I just bought some tiny cookie cutters- so cute. I love your blog!! 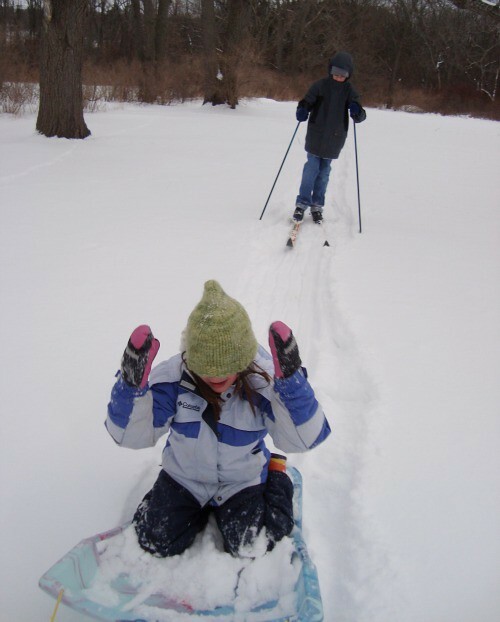 How good of you to break a trail for the cross country skiier! The cheddar crackers look so good, I'm going to try them out today! Thanks for sharing. 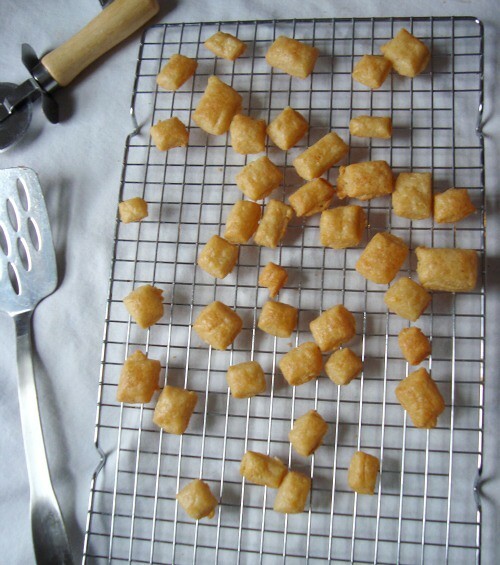 I am definitely going to try to make these cheddar crackers. My kids are eating through cheddar bunnies like they are afraid the store may stop selling them! Always love to try a new recipe - thanks Maya! We have little cookie cutters to try for next time, but after the little squares were gone so fast, I decided to make bigger ones... hoping they'd last longer. Logical? Maybe not. I'd love to hear if anyone else tries them with little cutters. Amy- if you have a gluten free recipe link I'd love it. I always enjoy an alternative. but I took her advice at the end and bought the book so I could try the rice flour version, except I used the Authentic Foods brown rice flour instead of white. My husband, who can eat all the gluten he wants, thought they were fantastic, and my son thought maybe I could make a double recipe so he could bring in 100 gluten-free cheese fish crackers on the 100th day of school. :) Oh, and since I had a gift card anyway, I bought a set of mini farm cookie cutters while I was at it, so maybe we'll do pigs or chickens next time. FUN! Oh Amy! thanks so much... off to go investigate. Pig and chicken crackers sound perfect! Thanks for this! My "home" goal for the new year is to buy less packaging also. My 1st order of business is to bake bread and make snacks. Question: if I sub whole wheat instead of the white flour, can I use regular whole wheat flour or should it be whole wheat pastry flour as you used? Betz- You can experiment with both. Pastry is lighter and makes for a more delicate pastry, etc. The amount of cheese and butter makes these pretty rich and I think (but haven't tried it out) that a standard WW would make a yummy, if only slightly hardier, cracker. Let me know and we'll compare notes. Also, I've brought my old bread machine out of storage and am having a new love affair with it on busier days. I prefer the process of bread by hand, but if you're going to be out a lot or want to set a timer to have hot bread in the morning... a machine is quite fun. Thank you for this. I was just missing my Cheez-Its last night, and remembered seeing a recipe somewhere for homemade cheese crackers (the one you linked), but hadn't take the time to search for it yet. I'm going to make these today. With half WW, half AP. Thanks again! We love cheese crackers. We make them in piped strips and call them cheese straws. My children eat them as I take them out of the oven. I just wish we had the snow to go along with them. 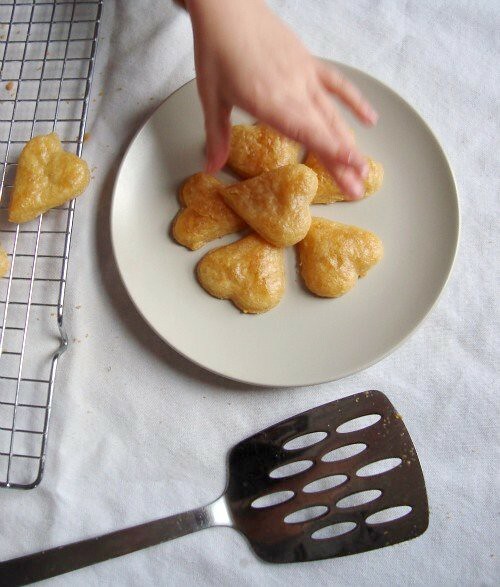 Having two little boys who love those little gold fish, I am eager to try this recipe. Thank you! I am so excited to try these! My son is addicted to bunny snacks and I've tried unsuccessfully to find a substitute. I also made a resolution this year to buy less packaged food - so far I've been whipping up granola, yogurt, croutons & some sweets. Last night we made these "healthy" cookies: http://www.101cookbooks.com/archives/nikkis-healthy-cookies-recipe.html. I'm not sure how healthy it is if all three dozen are eaten in less than 12 hours but they were delish. I have a bunny cracker eater over here too...but never have made a substitute! Thanks so much for posting this one!! Thanks for the link back...So glad you enjoyed the crackers! We too have a hard time restraining ourselves from eating all of them. I wish they would last longer...but they don't. I have tried them with whole wheat and they are just as good. thanks for the link to the recipe. i've been on a cracker quest of late. i've also tried to stop buying premade snacks, it's one of my last things that i buy packaged. i've been baking alot of the oat cookies from apples for jam; almost as healthy as a bisquit. the perfect thing for the little ones. Yay! Cheddar crackers are so delicious, but I never want to buy them from the store. Right on time for the Chinese New Year, too! Thanks for sharing - we love cheese crackers around here - we love to bake - so we'll be trying these later this week. Also thanks for the link to Savory Seasonings - even more homemade crackers to try there. Yea! I'm so glad you posted about cheese crackers and I have a reliable recommendation for a good recipe for them. Last week, I started looking(google) for a good recipe for some but I had too many choices and gave up(couldn't figure out which one to try. Good timing, I would say. Will be making these SOON! Thanks! And the snow? I sure wish we would get a little here. Just rain, cold, and fog here in Southern Oregon. Those look so good! Yum! On the weekend I made pear galettes (sound familiar?) and peanut butter cookies. Also got some bread baking books from the library so hope to try that soon. mmmmm. cheesy crackers sound good. and much better than the store bought alternative. Oh they look amazing! And your link to the pretzels is so timely! I remember making soft pretzels last winter and forgot about them until just now! It think I'll have to print out your recipe and give it a whirl! Thanks! oh dear I just dribbled all over my keyboard... this post needs a "yumminess salivation" warning :) I think puffy would have been my fave too. Thanks for sharing ! Hi Maya! There is an ice storm raging outside my window today so my oven is on and I am baking a classic banana bread. It is a basic recipe you'd find most anywhere but I never use shortening and just substitute applesauce instead.....oh yes, and a cup of dark chocolate chips got thrown in for good measure ! I must try these! Mind if I share the results on my blog? (With links to you, of course!) Thanks for sharing! oh my. these look delicious! we are big cheese fans in our house so i'm sure these would not last very long. thanks for sharing...i'm eager to try these out. I made these today with fresh ground hard white wheat. THEY WERE DELISH! The recipe is truely a keeper. Thank You!